To the Vancouver Art Gallery yesterday to see the O’Keefe exhibit. Anyone hoping to see her flowers would be disappointed as there are only a few of the smaller ones. But what is there of her early landscapes, some middle year pieces and some late, are brilliant – in particular, an early desert landscape, her use of paint/light. The word I take away from the exhibit is courage. Looking at her pieces, I read a truth that is rare. Something we as writers, painters, dancers, dream of. And whether or not one actually admires O’Keefe, I think it is clear, after viewing her work in person, why she is iconic. Oh yes, the photos of O’Keefe by Steiglitz and Webb are equally compelling. Somehow they open her and yet she isn’t yielding, she holds her ground. I spent the weekend recording two new pieces I’m working on. It just dawned on me that this new (and working!) MacBook has recording software so I decided to use it. so F. set me up with a pre-amp, a cute little box from TCHelicon called a VoiceTone Correct, Firewire and a mike, and boom, I was in business. Well it’s been a few years since I recorded anything (I’ve done backup vocals and had my voice used for product demos and for engineers to work on – there are more than a few engineers that loathe Centrepiece thanks to me) so it took a few takes to get used to the setup, but it was an amazing way to find out if a piece works or not… and I’m happy to say, the two poems I’ve worked on all week, are really starting to cook. Keep your eyes on this space and I’ll post something in the next while. Vancouver International Writers and Readers Fest. okay, so I took the ferry over on Sat. a.m. and caught the Poets Laureates (what’s the plural of that anyway? ), George Bowering (whom a CBC producer friend of mine has always called George Boring), our first PL of the Canadian Parliament, Carla Funk, Victoria’s 1st PL, George McWhirter, Vancouver’s 1st PL, and Agnes Walsh of St. John’s Nfld. as the unofficial poet laureate of my community (I read here and there, different occasions e.g. I’ll be reading at the Remembrance Day ceremony…) I thought it was an intriguing idea to gather four together, too bad the poets didn’t live up to its promise… maybe it’s me, but I had the distinct impression that they were all slightly embarrassed at being PLs – especially Bowering who seemed to want it made clear that he hadn’t sold out and bragged that he had been given a beautiful office overlooking Parliament, with access to a secretary etc. but he couldn’t find a use for it and subsequently only used it once. He did say that he enjoyed the travel and was pleased about an anthology he created. The PLs were all asked by the moderator about the perks and pitfalls. Carla Funk spoke of free parking while on official PL business, and of the request to write a poem for a children’s water feature and have the poem literally carved in stone the concept of which to most poets is terrifying – I know writers who change their words in their books. 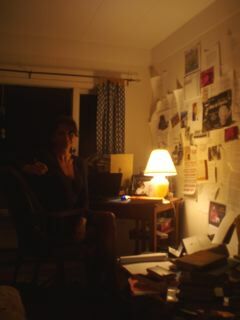 She also spoke of receiving unsolicited manuscripts from poets wanting her help and how unpleasant that was. Agnes Walsh spoke of her 5K per year and was quite envious of the free parking. George McWhirter spoke of getting a new suit and of the poetry map of Vancouver he’s working on. The PLs read a few times. GB did his piece slamming slam poetry. CF read Bundling and the Blue Spruce Cafe. AW read from her St John’s Bachelors, and GM read… I didn’t catch the names of the pieces. Maybe it’s because I lived in Edinburgh, where the Makar is really honoured, and it is considered a great honour to be named Makar, but I felt the PLs hadn’t really embraced and honoured what their respective cities had bestowed upon them. But then again, Edinburgh, and Scotland in general, loves words and writers. I could be wrong in my impressions, after all, what can these PLs possibly say in 1 1/2 hours especially with GB droning on… still, it was a disappointment. Later that night I went to the poetry bash, heard a handful of poets and left at half time. With the exception of Nils Hav, a Danish poet, all the poets were either Canadian or American, and I was hoping for a more international take on poetry. Nils was absolutely hilarious and made it worthwhile coming down to the event. The next day I caught Tim Bowling’s, The Lost Coast: Salmon, Memory and the Death of Wild Culture, an interview with Mark Forsyth of CBC about Tim’s memoir of growing up fishing on the west coast. I know Tim from Banff Writers Studio – he, Don MacKay and Anne Simpson were our editors that year. It was wonderful hearing Tim’s prose – beautiful, poetic, an undertow of sadness/melancholy/rage running throughout. Tim says he tries to give some hope, but overall, I anticipate the book might be more of an elegy for the Fraser River than anything else. I look forward to reading it. I read that quote to myself every day. 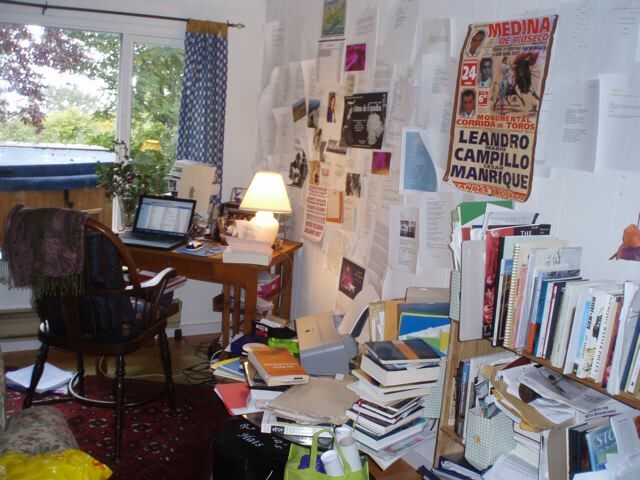 I’m always interested in what other writers’ work places look like… so here’s mine…. Last year, I gave a sculptor friend in Edinburgh, a copy of Lorca’s In Search of Duende, lectures Lorca gave on the subject in 1933, while visiting Buenos Aires. My friend says he’s struggling with the concept so I’m going to send him this article by Edward Hirsch in American Poetry Review. I think it’s worth reading. When we dance flamenco, this is the state we hope to reach… that “intersecting point of contact between… inner and outer worlds”. It’s very, very tough to find it, but when one does (and I have only for a brief second or two), it’s amazing. Here to visit. Decide to see Hastings and Main. Again. As teens, we saw movies there – an old vaudeville/burlesque theatre – moth-eaten curtains, velvet seats that snapped like crocodiles. Maybe nostalgia, but I recall tarnished cherubs. We sat in the balcony, smoked whatever, ate Nanaimo bars, laughed, necked. Saw the international/western film canon. Our philosophies forged in darkness. Afterwards, we’d head to the Joint- a jazz haven that poured “special darks” (rum) – to talk, talk, talk. We’d walk Hastings and Main – past drunks, junkies, prostitutes, sailors off ships, loggers out of camp, all hot to trade paychecks. No one bothered us – everybody left everybody alone back then. Today, one word loops – shame, shame, shame. Only one light- the Carnaby Centre – outdoor tables, chairs, where people recreate humanity. Buy a guy coffee. Apologize. Want to march citizens through the damned blocks, as Allies walked townspeople through Buchenwald in 1945. Let them see what they turn heads from. Smell the air.